I was first introduced to animation thru stop motion when I was told that there were 24 frames in one second of film. I wasn't clear on that concept when I set up a small clay character to test this fact. I had thought that each sound was a separate move and so, everytime I moved the character, I clicked the camera 24 times. After shooting this test, I had thought that my little clay man would wave to the camera and then walk off screen. At the time, a second seemed like a very short amount of time and I hoped that I had shot enough of the test to be able to see it. 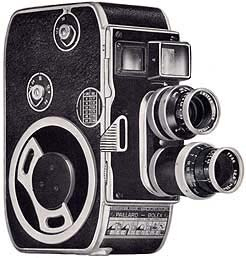 Back in the day, you had to wait about 3 to 5 days before you could get the developed Super 8mm back from the lab. he moved and a second later moved again. My animated man was not as fluid in motion as I had imagined, instead he moved like a clock, changing his position every second. It was then I realized it was possible to move the character every other frame and that a second had suddenly become a longer period of time than I had thought. Flash forward to the High School years, I've made more super 8 films, and even a subscriber to Super 8 Filmmaker magazine. I also look for books about Animation, trying to learn anything I can since I'm in Florida with two friends who are doing the same thing. We all to go see some movie called "Star Wars", one reviewer called it "The Wizard of Oz in Outer Space." That Summer in 1977, 3 inspired High School filmmakers run through the parking lot acting like Tie Fighters, life suddenly changed. Lightspeed forward to today, I am teaching a group of High School students three different types of animation in 7 weeks. Beginning with Stop Motion, I have discovered that the best way to introduce the whole concept of animating is to begin with Pixelation. This is allows shy and awkward students to get to know each other by working as a group while creating stop motion frame by frame. GroupShoot01 from Toondini on Vimeo. To eliminate the crowded animation, I limited it down to 4 people; 2 people enter, followed by two more people. The first 4 people play for a while and after, say 5 seconds or 120 frames, you have 4 new people assume the previous poses and whatever the previous costume the person has on like a silly hat, sunglasses, etc. We are using DragonFrame software which allows us to see the previous frame as an Onion skin effect. The 4 new people get into position and then you can have them continue animating from the new start position. I did this with 2 more groups of 4. The people who are waiting and watching can also help the performers by switching out props or moving other objects in the scene. I always start off the project by showing how long it takes to A to B. I also like sliding instead of walking. I walk all the time, but in stop motion I can glide in without moving my legs. I explain how to ride a broom by jumping up we the picture it shot, this does take some practice since there is a delay when the camera takes a frame. Also you have to do this one frame at a time, because shooting on two's will look great on the first frame, but you body will be down on the second one. Here's an example of the group of 4 animation approach as well as. Which one do you like better? StopMotionFilms2015 from Toondini on Vimeo. One of many great things, about this software is that you can check what you have shot at anytime. And when everyone has gotten a chance to perform in front of the camera, you can instantly view what you have just shot. I would have loved to have had this when I was in High School. Everyone now gets the idea how long is takes to animate themselves around in front of the camera and are ready for more. And so, we head inside the animation studio under the hot lights of two animation sets. Note to self: turn on the air conditioner before filming begins, otherwise you will soon have a very "hot" set. My point is, the appeal is in how the idea is revealed. The idea to presented here and it doesn't have to be precisely animated to do this. And without any prior animating experience, I think they did a great job. Still editing and adding to this blog, if you have any comment, suggestions or can't see a video or photo, please let me know. Thanks!